Do You Want To Know How You Can Add Pinterest Follow Button To Your Website. This Is Your Best Choice To Add It On Your Website. Pinterest Is a World Top Social Network. On Pinterest You Can Share Your Things Like Photos , Ideas Or Your Website Links Well. Pinterest Have a Millions Of Active User From The World Every Day. You Know Pinterest Is a #1 Social Network By Womens. Mean`s Pinterest Have a Large Number Of Only Female. With The Pasess Of Time Number Of Pinterest Are Increasing Fastly. Like Other Social Networks #Facebook , #Twitter or #Google+ Pinterest Is Also a Best Social Network. Everyone Can Use Pinterest Well. On Pinterest You Can Promote Your Website , Blog Or Business As You Want. You Can Create Boards Related To Your Web Or Business. 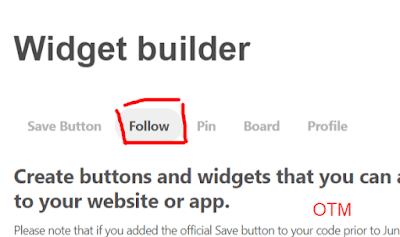 6 ==> Finally You Can See Your Pinterest Follow Button Preview , If You Agree Then Copy Your HTML Code. Here You May See Two Code But You Only Copy First Code Only. 7 ==> Go Back To Your Website Or Blog , Open Layout Of Your Website Or Blog. Select “Add a Gadget ” , Then Select ” HTML / JAVA SCRIP “ And Paste Your Pinterest Code Here. Click On Save And Refresh Your Website Or Blog , Open Your Web You Can See I am Right I Tell You Every Thing Which Help You Perfectly.If You Have Interest Go To pinterest login And Follow All Above Steps. take updated from newest reports.